Hello ladies! Katie P here, from Food, Wine, & Mod Podge, for Week 3 of Love It or Lose It. How did your week go? 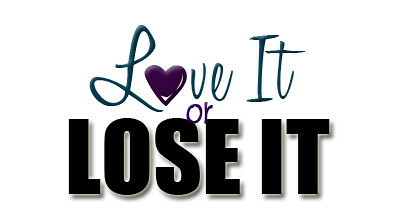 For a rundown of Love It or Lose It, check out the rules here. I had a pretty good week myself. I worked two Love It or Lose It tops into my clothing rotation, and made some headway! Now here we go! It's lightweight, so good for spring months. 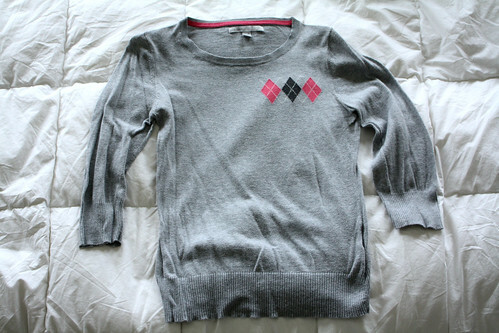 It's got a cute pink argyle detail. Since it is lightweight, I recall the ends of the sleeves stretching out a little bit. It's also a little short, but that's the story of my clothing life. I wore this shirt on the weekend with a cute white-with-teensy-little-pink-polka-dots long cami underneath, which matched the pink in the argyle perfectly, and solved the length problem. And the thinness issue? All in my head. It happens sometimes. Love it again! I love this shirt so much. 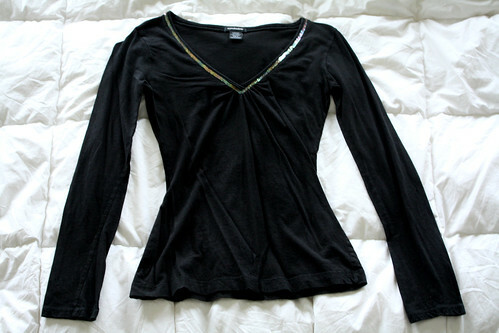 When I bought it, it was the perfect length, the perfect fit, and the row of sequins along the collar gave just the perfect amount of sparkle without appearing bedazzled. This shirt has just been loved a little too much. The black has faded, there is a little hole in the back from when my cat jumped on me, and after so many washes, the length has shortened. Basically, it's just time to part ways. I knew before even putting it on that it was time to move this out of my closet. It served me well, but I don't wear it anymore because it just isn't nice and classy anymore. I did try it on for one last hurrah, but changed before leaving the house. So in a way, still Love It, but time to Lose It. Not a bad week! 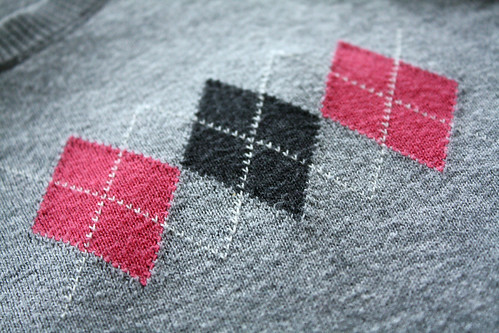 I realized I was overlooking a great little sweater, and finally came to terms with parting with an old love. 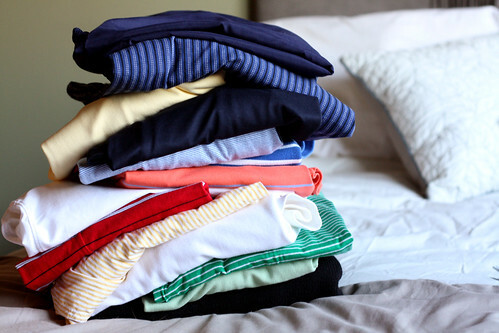 As a fun twist, the hubby decided with all this closet-cleaning that maybe he too should take a stab at it! Even MORE clothes for charity! How did your third week go? Did you lose steam, or did you power through a whole stack of items? Are you rearin' to go for the final week? Link up your stories below! I love this series! it's amusing, why we keep certain pieces of clothing, isn't it?